Oct. 29th from 4:00-6:00 pm at Gilda’s Club 1234 E. River Drive Davenport, Iowa 52803. 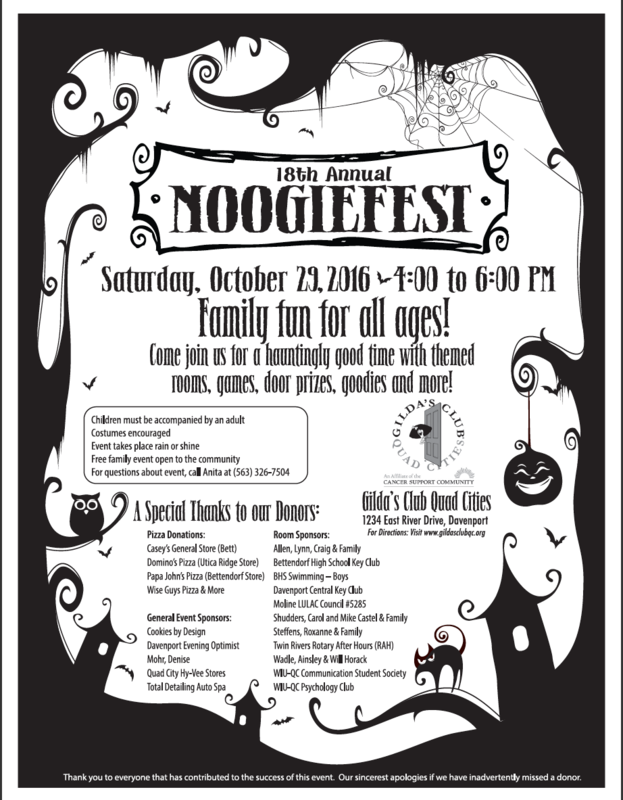 Noogiefest is a free Halloween/Fall Festival party for children and their families. Help make our 18th year an amazing experience by joining us for a hauntingly good time with themed rooms, games, crafts, door prizes, pizza, goodies and more! Children must be accompanied by an adult. Costumes encouraged. Free event open to the community. Event to take place rain or shine at Gilda’s Club. Family Fun for all ages! Sign up to win a door prize, enjoy goodies and go from room to room participating in a variety of games and activities!